Automotive Biometrics is an electronic device utilized for identification and authentication in vehicles for number of applications mainly, vehicular access, ignition switch, vehicle immobilizer, rationalization, and health monitoring. Biometric systems could be in any form such as fingerprint scanner, facial recognition, voice recognition, and others. 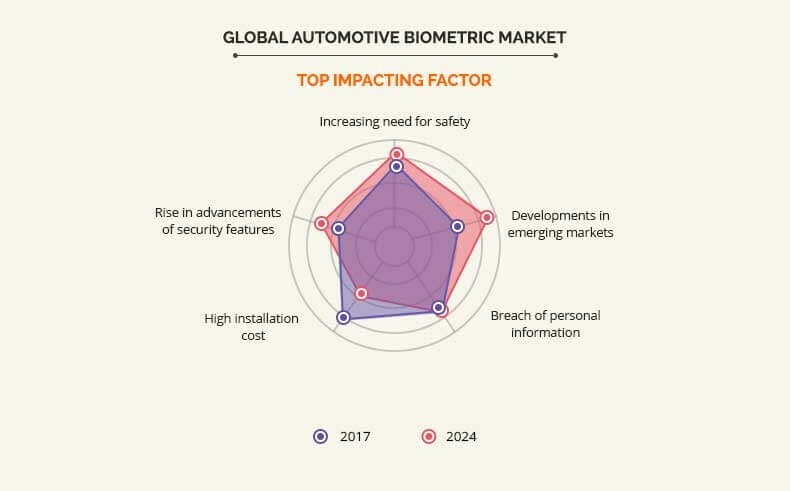 The global automotive biometric market is segmented based on technology, vehicle type, and region. By technology, the market is divided into fingerprint scan, voice recognition, facial recognition, and others. Based on vehicle type, it is bifurcated as passenger cars and commercial vehicle. Based on region, it is analyzed across North America, Europe, Asia-Pacific, and LAMEA. Hitachi, Ltd., Fujitsu Limited, Nuance Communications, Voxx International Corporation, Safran S.A, Synaptics Incorporated, ASSA ABLOY AB (HID Global Corporation), BioEnable Technologies Pvt. Ltd, Fingerprint Cards AB (publ), Methode Electronics, Inc. are some of the key players operating in the industry. Increase in need for safety and developments in emerging markets impact the growth of the market. However, high installation cost of the biometric systems affects the growth adversely. A major factor that drives the growth of the automotive biometric vehicle access system market is the high rate of accuracy as it asks for biological evidences such as fingerprint scan, face & others, hence, increasing the level of safety. Biometric access system does not ask for passwords, which makes it difficult to be hacked or stolen. Moreover, hackers cannot easily track down the passwords as the access is given on the owner’s recognition. In addition, biometric vehicle systems are easier and faster with respect to the operating pace. Some of the car manufacturers such as Ford, BMW, Mercedes-Benz, and Volkswagen plan to incorporate the biometric system in the cars for the safety and convenience of the customers. The need for better security management impacts both the developed and the developing economies to protect themselves from unknown entities such as theft or other disturbing activities. Major players in the biometric technology try to establish themselves in the emerging markets. The different technologies used in the automotive biometric access systems are fingerprint scanner, facial recognition, voice recognition, and others. However, as the installation cost of biometric devices are high, there is a possibility that only certain car manufacturers can afford this technology in the cars. This acts as a restraint for the growth of the automotive biometric systems market. 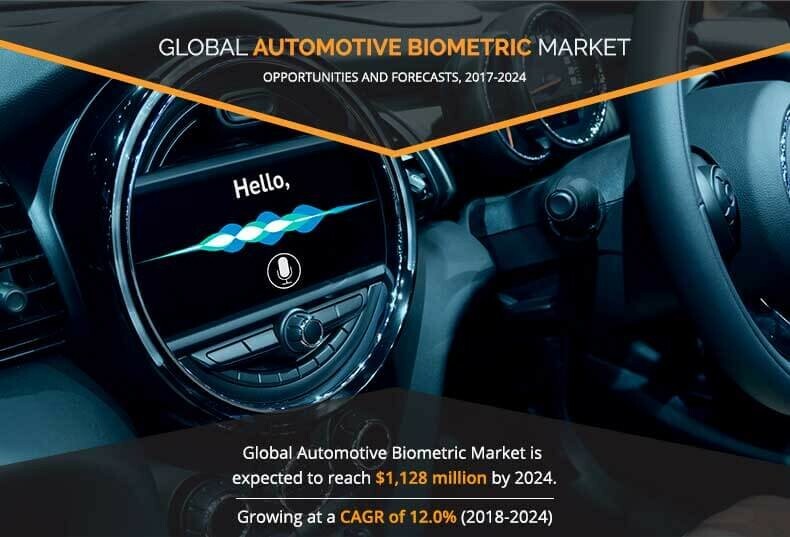 This study comprises analytical depiction of the global automotive biometric market with current trends and future estimations to depict the imminent investment pockets. Vulnerabilities in the existing systems of keyless entry boost the adoption of biometrics in the automotive industry. Thus, the increase in need for safety propels the growth of the market. Some of the car manufacturers such as Ford, BMW, Mercedes-Benz, and Volkswagen plan to incorporate biometric system in the cars for the safety and convenience of the customers. Faraday Future, incorporated an external camera in their prototype SUV FF91 to recognize the car owner to provide access to the vehicle. The launch of technologies such as driver identification, biometric seats & steering wheel, and automated engine starters are anticipated in the near future. Among the analyzed geographical regions, Europe accounted for the highest revenue in the global market in 2017 followed by North America, Asia-Pacific, and LAMEA. The robust automotive industry in the Europe and the increase in demand for advanced features and security drive the market growth in the region. However, Asia-Pacific is expected to grow at a higher growth rate, predicting a lucrative market growth. Increase in demand for luxury vehicle segments in Asia-Pacific boosts the demand for biometric systems. Further, technologically advanced products are increasing rapidly in the regions of China and India. This makes way for different lucrative market growth opportunities. Hitachi, Ltd., Fujitsu Limited, Nuance Communications, Voxx International Corporation, Safran S.A, Synaptics Incorporated, ASSA ABLOY AB (HID Global Corporation), BioEnable Technologies Pvt. Ltd, Fingerprint Cards AB (publ), Methode Electronics, Inc. are the key market players that occupy a significant revenue share in the automotive biometric market.